While summer is upon us, it's never too early to start thinking about September and the start of the new school year. That means fresh blank notebooks, shiny new pens, colorful folders, bright yellow highlighters and a huge dent in your wallet. For low-income families, the end of summer can bring considerable financial stress as they prepare their children for school -- the average cost of a new backpack filled with grade-appropriate school supplies hovers around $81. 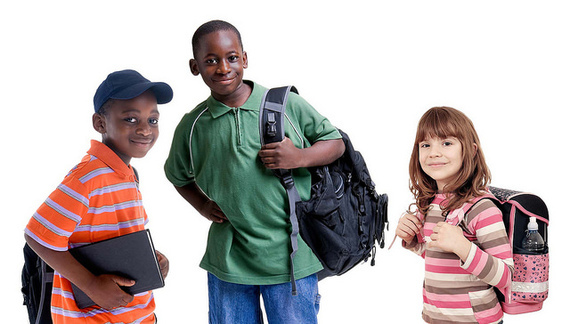 Since 2001, Volunteers of America Greater NY has conducted Operation Backpack®, an annual campaign to ensure children living in a New York City homeless or domestic violence shelters return to school with new backpacks brimming with grade-specific supplies. Last year, the organization distributed 18,400 backpacks; this year, VOA anticipates 20,000 requests. Operation Backpack has grown exponentially, in response to the increasing number of families living in shelters. Vital to the organization's ability to respond is the continued support of hundreds of corporate and community partners, who hold workplace drives, volunteer to assemble backpacks, become financial sponsors and enlist the support of their employees in helping the city's most vulnerable students. Many long-term partners find holding a drive to be a valuable tradition that boosts morale, engages summer associates and fulfills corporate responsibility commitments. For some companies and community groups, workplace drives may not be feasible but with Volunteers of America's use of CrowdRise a crowdfunding site, groups can form teams and raise money virtually, relying on the strength of their networks and playing a crucial role in the campaign's success. Donations have been made from as far as Hong Kong. This year's support comes from companies of all industries, including finance, law, technology, real estate and media. SONY Corporation of America joined the fold this year, donating 2,500 USB drives for the high school backpacks. Returning financial donors, including HSBC, Duane Reade Charitable Foundation, and Select Equity, as well as major in-kind sponsors, such as RXR Realty, 21st Century Fox, FedEx, HarperCollins and Weeks Lerman, hope to contribute to another record-breaking year. From an inspired realization in an office supply store of the needs of homeless families to this year's donation of 2,000 backpacks from the New York Yankees, Operation Backpack continues to support and prepare young students for success in the classroom. And providing the right supplies is critical to their success. "We are more than doubling the number of USB drives we are distributing because we know that our kids do not have computers of their own and rely on libraries and public areas for computer access," said Rachel Weinstein, Operation Backpack founder and Vice President/Chief Development and Communications Officer at Volunteers of America-Greater New York. "Technology like this is critical to their keeping up with their classmates, feeling prepared and confident, and knowing that someone believes in them," Weinstein said. "We need to do everything we can to ensure these vulnerable children stay in school and earn a high school diploma, which is essential to breaking the cycle of homelessness." The campaign will kick off on Monday, July 13 and continue through Friday, August 7. While it was started in New York City, Operation Backpack has been adopted by a number of VOA affiliates nationwide to help thousands of the country's most vulnerable students get a good start to the new school year. The organization is seeking new sponsors and partners, both in New York City and nationwide. To learn more about corporate and community partnership opportunities, visit the site. Support at any level for Operation Backpack is welcome. Paige Davis, Broadway actress and host of TLC's Trading Spaces and OWN's Home Made Simple, is a VOA-GNY Board Member. This year marks her 10th year as spokesperson for Operation Backpack. "There is nothing more heartening than seeing the New York City community, and people across the country, contributing to this effort in support of children's education. It's an honor for me to participate in this much-needed program and see the first day of school for young students become one of the best days of the year for them," said Davis. The public is urged to drop off a new backpack and/or school supplies at participating Duane Reade and Walgreens stores in New York City from July 13th to August 7th in NYC. Financial donations, accepted year round, can be made here. Photo: Volunteers of America-Greater New York. All Rights Reserved.